Camping Clairac is situated on the grounds of a former vine yard: "Domaine de Clairac". The camping is located in the middle of vines and olive trees but only 5 minutes from the town center of Béziers, 15 minutes from the Mediterranean Sea and 20 minutes from the mountains! 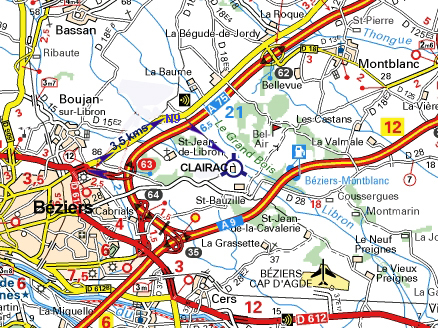 The entrance to the "Domaine de Clairac" is on the south side of the main road (N9/N113), 5 km from Béziers and 15 km from Pézenas. Follow our direction or your GPS. Never both of them at the same time. Gate N° 35 "Béziers Centre". 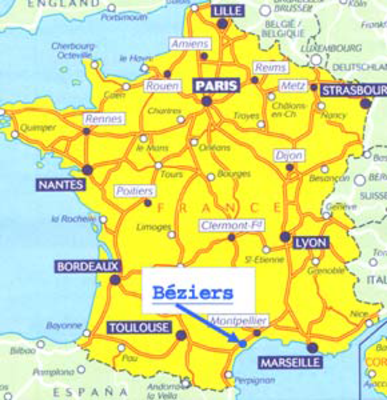 1st roundabout : direction "Béziers-Centre". 2nd and 3rd roundabout : direction "Pézenas". 4th roundabout : direction "N9/PAE La Baume". Then 3,5 km on the N9. Then turn right "Domaine de Clairac", "Camping Clairac". At the roundabout, direction "N9/PAE La Baume". Where you always want to return. Camping Clairac on Google maps.